The Airbus A350 is a long-range, mid-sized, widebody family of airliners currently under development, designed to compete with the Boeing 777 and Boeing 787. 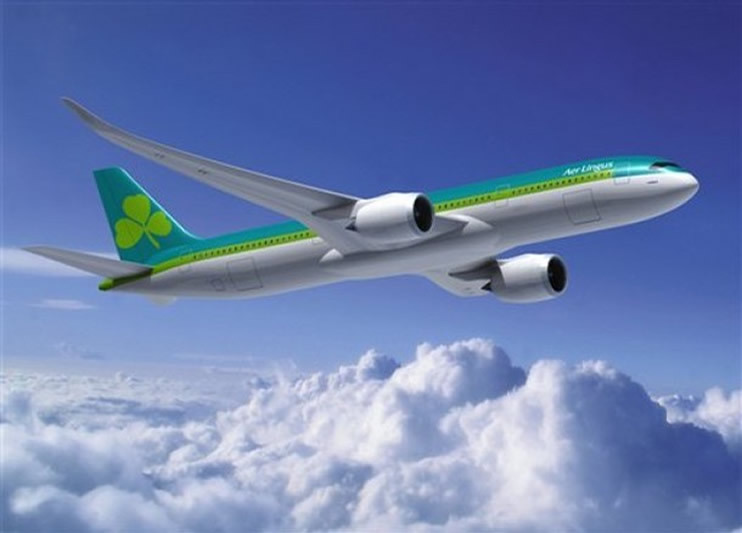 It will also compete with Airbus' own A330 and A340, since plans to discontinue those models have not been announced. When Boeing announced its 787 Dreamliner project, it claimed the lower operating costs of this airplane would make it a serious threat to the Airbus A330. Publicly, Airbus initially rejected this claim, stating that the 787 was itself just a reaction to the A330, and that no response was needed to the 787. The airlines pushed Airbus to provide a competitor, as Boeing had committed the 787 to have 20% lower fuel consumption than today's equivalent types. 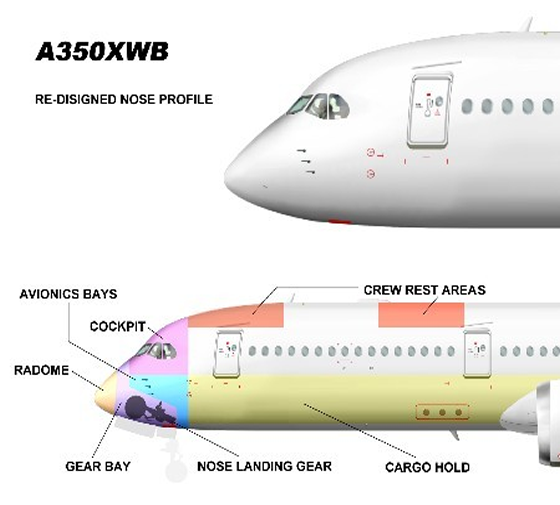 Initially Airbus proposed a simple derivative of the A330, unofficially dubbed the 'A330-200Lite', with improved aerodynamics and engines similar to those on the 787. The airlines were not satisfied and Airbus committed €4 billion to a new design to be called the A350. The original version of the A350 superficially resembled the A330 due to its common fuselage cross-section and assembly. A new wing, engines and a horizontal stabilizer were to be coupled with new composite materials and production methods applied to the fuselage to make the A350 an almost all-new aircraft. 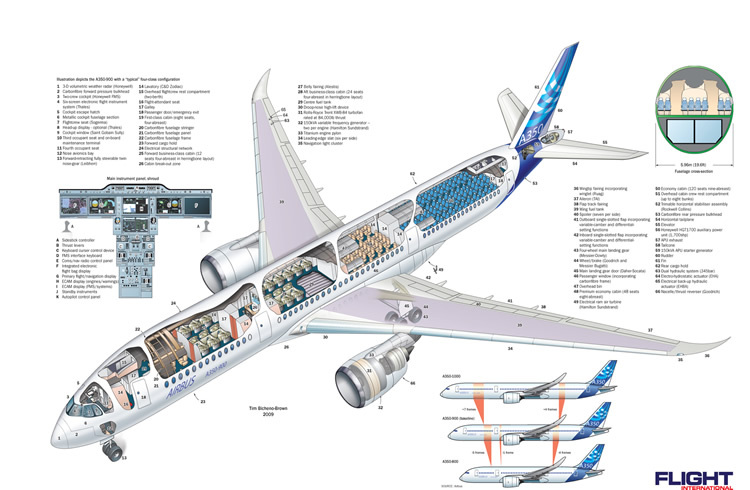 On 16 September 2004, then Airbus president and CEO Noël Forgeard confirmed that a new project was under consideration, but did not give a project name, and would not state whether it would be an entirely new design or a modification of an existing product. 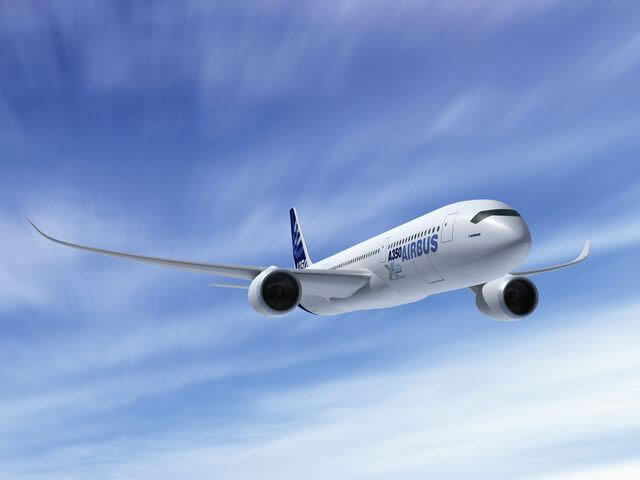 Forgeard indicated that Airbus would finalise its concept by the end of 2004, begin consulting with airlines in early 2005, and aim to launch the new development programme at the end of that year. On 10 December 2004 the boards of EADS and BAE Systems, then the shareholders of Airbus, gave Airbus an "authorisation to offer (ATO)", and formally named it the A350. On 6 October 2005 full industrial launch of the program was announced with an estimated development cost of around € 3.5 billion. This version of the A350 was planned to be a 250–300-seat twin-engined wide-body aircraft derived from the design of the existing A330. Under this plan, the A350 would have modified wings and new engines while sharing the same fuselage cross-section as its predecessor. Controversially, the fuselage was to consist primarily of Al-Li, rather than the CFRP fuselage on the 787. It was to see entry into service in 2010 in two versions; the A350-800 capable of flying 8,800 nautical miles (16,300 km) with typical passenger capacity of 253 in 3-class configuration and the 300-seat (3-class) A350-900 with 7,500 nautical mile (13,890 km) range. It was designed to be a direct competitor to the 787-9, and 777-200ER. Almost immediately Airbus faced criticism on the A350 project by the heads of two of its largest customers, ILFC and GECAS. On 28 March 2006, in the presence of hundreds of top airline executives, Steven F. Udvar-Hazy, of ILFC lambasted Airbus' strategy in bringing to market what they saw as "a Band-aid reaction to the 787," a sentiment which was echoed by GECAS president Henry Hubschman. Udvar-Hazy called on Airbus to bring a clean-sheet design to the table, or risk losing most of the market to Boeing. Several days later, similar comments were made by Chew Choon Seng, CEO of Singapore Airlines. Chew stated, "having gone to the trouble of designing a new wing, tail, cockpit" and adding advanced new materials, Airbus "should have gone the whole hog and designed a new fuselage." 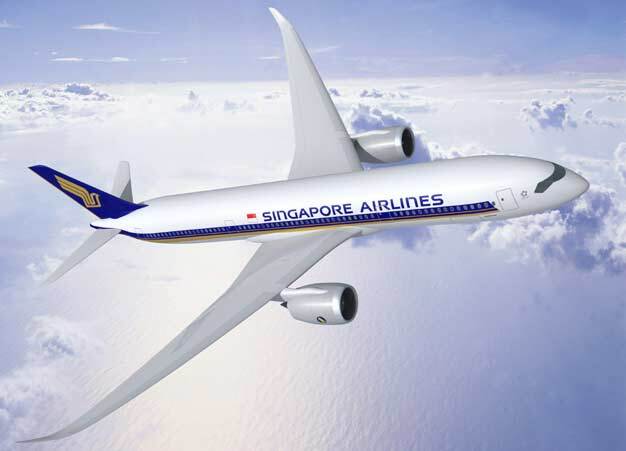 At the time, Singapore was reviewing bids for the 787 and A350. Airbus responded by stating it was considering improvements for the A350 to satisfy customer demands. At the same time, Airbus then-CEO Gustav Humbert suggested that there would be no quick fixes, stating, "Our strategy isn't driven by the needs of the next one or two campaigns, but rather by a long-term view of the market and our ability to deliver on our promises." On 14 June 2006, Singapore Airlines announced it had selected the 787 over the A350, ordering 20 787-9s. Emirates decided against making an order for the initial version of the A350 because of weaknesses in the design. 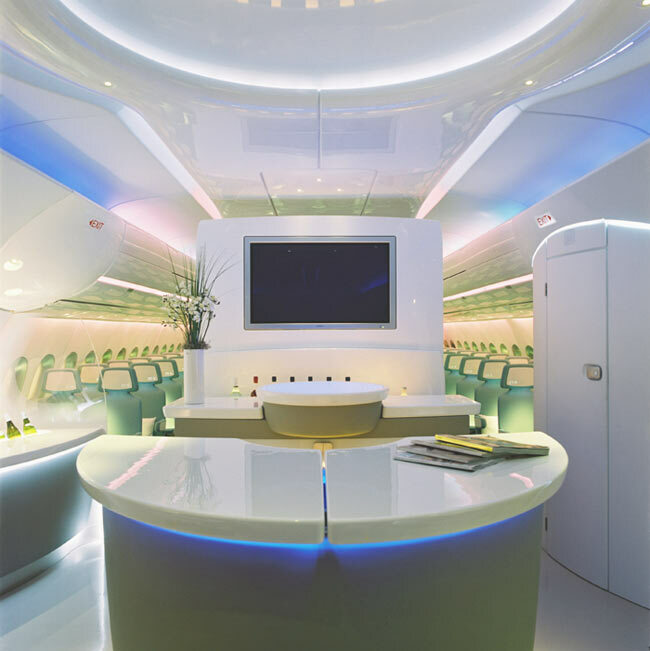 Interior of the Economy Class Of the A350 XWB.As a result of these criticisms, in mid-2006 Airbus undertook a major review of the A350 concept. The proposed new A350 was to become more of a competitor to the larger Boeing 777 as well as some models of the Boeing 787, with a larger fuselage cross-section able to accommodate 9 passengers per row in economy class. The A330 and previous iterations of the A350 would only be able to accommodate 8 passengers per row in normal configurations. The 787 can accommodate 8 or 9 passengers per row, while the 777 can accommodate 9 passengers per row (or, rarely, 10). From the point of view of a seated passenger, the cabin is 13 cm (five inches) wider at eye level than the competing Boeing 787, and 28 cm (eleven inches) narrower than the Boeing 777, its other competitor. All A350 passenger models will have a range of at least 8,000 nautical miles (15,000 km). There was some speculation that the revised aircraft would be called the Airbus A370 or A280, with Airbus going as far as accidentally publishing an advert referring to the aircraft as the "A280" on the Financial Times website. However, on 17 July 2006, at the Farnborough Air Show, Airbus announced that the redesigned aircraft would be called A350 XWB (Xtra Wide-Body). Airbus achieved its first sale of the redesigned A350 four days after its unveiling when Singapore Airlines announced an order for 20 A350 XWBs with options of a further 20. Its CEO, Chew Choon Seng, said in a statement, that "it is heartening that Airbus has listened to customer airlines and has come up with a totally new design for the A350." Late in 2006 a decision on formal launch was delayed as a result of delays of the Airbus A380 and wrangles about how the development would be funded. EADS CEO Thomas Enders stated that the A350 program was not a certainty, citing EADS/Airbus' stretched resources. On 1 December 2006 the EADS board agreed the industrial launch of the sixth iteration A350 with costs mainly borne out of cash-flow. First delivery for the -900 is scheduled for mid-2013, with the -800 and -1000 following on, respectively, 12 and 24 months later. At a press conference 4 December 2006 a few new technical details of the A350 XWB design were revealed, but no new customers were identified and John Leahy indicated existing A350 contracts were under re-negotiation due to increases in prices compared to the original A350s contracted. On 4 January 2007, Airbus announced that Pegasus Aviation Finance Company had placed the first firm order for the A350 XWB with an order for two aircraft, though the variants were unspecified at the time. 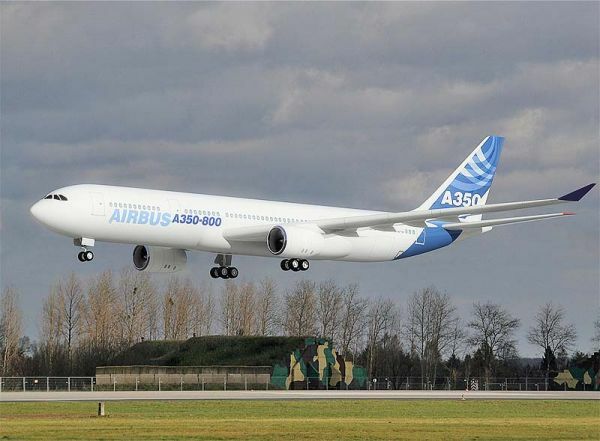 The Airbus board of directors approved the industrial launch of the A350-800, -900 and -1000 in December 2006. The XWB will impose a couple of years of delay into the original timetable and almost double development costs from $5.3 billion to approximately $10 billion. During 2007 Paris Air Show, Airbus won firm orders for 141 A350 XWB and at the Dubai Airshow it won firm orders for 165 A350 XWB. Older design for the cockpit of the Airbus A350, now replaced with all-new flight deck designOn September 2007, Airbus rolled-out new design advances to a gathering of 100 representatives from existing and potential XWB customers. The A350 XWB will be built on the technologies developed for Airbus A380 and will have a similar cockpit and fly-by-wire systems layout. Airbus claim that 52% of the aircraft will be made out of composites, 20% Al/Al-Li, 14% titanium, 7% steel and 7% the balance. This compares to the Boeing 787, which consists of 50% composites, 20% aluminium, 15% titanium, 10% steel and 5% the balance. October 2008 is the Airbus internal goal to freeze the design and Airbus expect 10% lower airframe maintenance cost and -14% lower empty seat weight than competing aircraft. Airbus claim that the new design comprise a better cabin atmosphere with 20% of humidity level, pressurization at 6,000 ft (1,800 m) and flow management system that adapts cabin airflow to passenger load with draft-free air circulation. The new XWB fuselage will have a parallel cross-section width from door 1 to door 4, unlike previous Airbus aircraft to provide maximum usable volume. The double-lobe (ovoid) fuselage cross-section will have a maximum outer diameter of 5.97 m (compared to 5.64 m for the A330/A340). The cabin's internal diameter will be 5.61 m wide at armrest level (compared with 5.49 m of the 787 and 5.86 m of the 777). In the eight abreast two-four-two arrangement, which is a premium economy layout, the seats will be 19.5 in (49.5 cm) wide between 2-in wide arm rests. Airbus claims that the seat width will be 0.5 in greater than the seat on the 787 in the equivalent configuration. In the nine abreast, three-three-three economy layout, the XWB's seat width will be 17.7 in which will be 0.5 in wider to the proposed equivalent seat layout for the Boeing 787. Airbus confirmed in early September 2007 the adoption of composite fuselage frames for the aircraft structure. The composite frames will feature aluminium strips to ensure the electrical continuity of the fuselage (for dissipating lightning strikes). However, the fuselage crossbeams remain metallic, but Airbus is running trade-off studies to evaluate the switching them to composite. The new design differs slightly from the 787 design which uses ovoid skin barrels on titanium ribs. Airbus had signed a firm contract with BMW to have them develop an interior concept for the original A350. The A350 will feature new all-composite wings that will be common to all three proposed variants. With an area of 443 m² (4,740 ft²) it will be the largest wing ever produced for a single-deck widebody aircraft. The geometric wingspan of 64 m (210 ft) is 3.7 m greater than that of the A330 and the original A350. The current biggest twinjet wing belongs to the long-range Boeings 777-200LR/777-300ER, which have 0.7 m greater span but slightly less area. The new wing will have 35 degrees of sweep (5 degrees more than the A330) helping to increase typical cruise speed to Mach 0.85 and maximum operating speed to Mach 0.89. Airbus is currently working on the detail of the wings' aerodynamics and it will not freeze the final configuration until the October 2008 design freeze milestone. A new trailing-edge high-lift system has been adopted with an advanced dropped hinge flap (similar to that of the A380) which permits the gap between the trailing edge and the flap to be closed with the spoiler. The manufacturer has carried out 1800 hours of low-speed windtunnel testing and results have led to a slight reduction of the static engine's thrust due to a better low-speed performance than anticipated. High-speed performance testing has begun at the European Transonic Windtunnel in Cologne, Germany and a final decision regarding winglet configuration is expected soon. Airbus is planning a £570 million (US$760 million) investment to upgrade composite capability at its Broughton site in the United Kingdom, in preparation for its role as final assembly location for the A350 XWB wing. The XWB's nose section will adopt a configuration derived from the A380 with a forward-mounted nosegear bay and a six-panel flightdeck windscreen. This differs from the dramatic four-window arrangement that was proposed in the original design. The new nose will improve aerodynamics and enable overhead crew rest installed further forward and eliminate any encroachment in the passenger cabin. The new windscreen has been revised to improve vision by reducing the width of the center post. The upper shell radius of the nose section has been increased. The nose is likely to be constructed from aluminium but Airbus is currently running trade-off studies considering one-piece carbon fiber structure. According to Gordon McConnell, A350 Chief Engineer, a carbon fiber structure will need titanium reinforcements for birdstrike, thus the aluminium structure is the best cost wise. 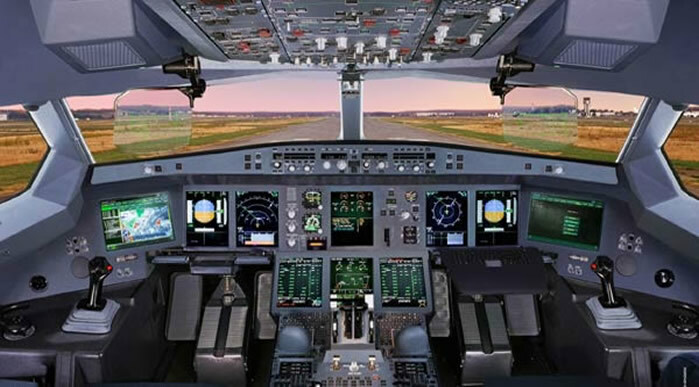 The new revised design of the cockpit have gone away from the A380-sized display and have adopted a 15-in (38 cm) LCD displays. The new six-screen configuration will have two central displays mounted one above other (the lower one above the thrust levers) and a single (for each pilot) primary flight/navigation display with an on-board information system screen adjacent to it. Airbus claim the new cockpit will allow to put more advances in navigation technology on the displays in the future plus flexibility and capacity to upload new software and to combine data from multiple sources and sensors for flight management and aircraft systems control. The A350 XWB will also feature a heads-up display. The avionics will be a further development of the integrated modular avionics (IMA) concept found on the A380. The A350's IMA will manage up to 40 functions (versus 23 functions for the A380) such as landing gear, fuel, brakes, pneumatics, oxygen system, full cabin pressurisation system and fire detection. Airbus claims benefits such as reduced maintenance and less weight because IMA replace multiple processors and LRUs with around 50% fewer standard computer modules known as line replaceable modules. The IMA runs on a 100 Mbit/s network based on the avionics full-duplex (AFDX) standard, already employed in the A380 instead of the Arinc 429 system on the A330/A340. Contract for the avionics suite is expected to be awarded soon. For the engines Airbus has confirmed that they will retain a full bleed air system on their engines, rather than the bleedless configuration used on the Boeing 787. Rolls-Royce has agreed with Airbus to supply a new variant of the Trent engine for the A350 XWB, currently called the Trent XWB. After the low-speed windtunnel test, Airbus has frozen the static thrust at sea level for all three proposed variants in the 74,000-92,000 lb range. GE has stated it will not offer the GP7000 on the aircraft, and that previous contracts for the GEnx on the original A350 did not apply to the XWB. In April 2007, Airbus former chief executive Louis Gallois held face-to-face talks with senior General Electric management over finalizing the possible go-ahead of a new variant of the GEnx engine for the A350 XWB. Airline pressure for a GE engine option is believed to be coming particularly from US Airways and Singapore Airlines, as well as others within the A350 orders group that either originally selected GE or that have not yet settled for the Rolls-Royce Trent XWB-powered option. 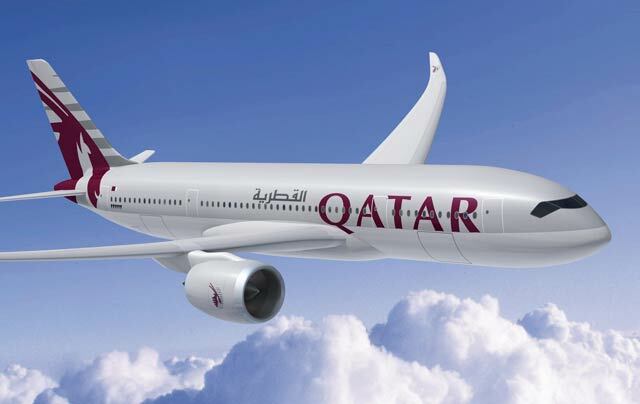 But on June 2007, Rolls-Royce announced that it had signed its biggest ever contract with Qatar Airways for the Trent XWB to power 80 A350 XWBs on order from Airbus worth $5.6 billion at list prices and in June 2007, Airbus' Chief Operating Officer John Leahy indicated that the GEnx engine will not feature on the A350 XWB, claiming that Airbus wants GE to offer a more efficient version for the new Airbus airliner. Both Singapore Airlines and US Airways have selected the RR Trent XWB for their future fleet of A350. The Trent XWB will feature a 118 in (3 m) fan diameter and the design will be based on the advanced developments of the Trent 900 (Airbus A380) and Trent 1000 (Boeing 787). The Trent XWB may also benefit from the next-generation reduced acoustic mode scattering engine duct system (RAMSES), which is a noise-dampening engine nacelle intake and a carry on design of the Airbus's "zero splice" intake liner developed for the A380. The A350 XWB will feature a 1,700 shp HGT1700 APU by Honeywell, which has 10% greater power density than the previous generation of the Honeywell's 331 APU family. Honeywell will also supply the air management system which comprise the bleed air, environmental control, cabin pressure control and supplemental cooling systems. The ram-air turbine will be now localized on the belly and the generator requirement is 100 kVA compared to 150 kVA for the A380. The selection of U.S. based Honeywell supplier is part of Airbus strategy to select complete work packages to a smaller number of major suppliers who are becoming system integrators on the programme. Airbus has adopted a completely new philosophy for the attachment of the A350 XWB’s main landing gear as part of the switch to a composite wing structure. Each XWB's main landing gear leg is going to be attached to the rear wing spar forward and to a gear beam aft, which itself is attached to the wing and the fuselage. To help reduce the loads further into the wing, a double side-stay configuration has been adopted. This solution resembles the design of the Vickers VC10. Airbus devised a three-pronged main landing gear design philosophy encompassing both four- and six-wheel bogies to ensure it can keep the pavement loading within limits. The A350-800 and A350-900 will both have four-wheel bogies, although the -800's will be slightly shorter to save weight. Both will fit in the same 4.1 m (13.5 ft) long bay. The proposed higher weight variant, the A350-1000 (and the proposed A350-900R and A350-900F) will used a six-wheel bogey and a 4.7 m landing gear bay. Messier-Dowty was chosen to provide the original A350's main landing gear, and has been confirmed to be providing the main landing gear for the new XWB. The nose gear will be supplied by Liebherr-Aerospace. 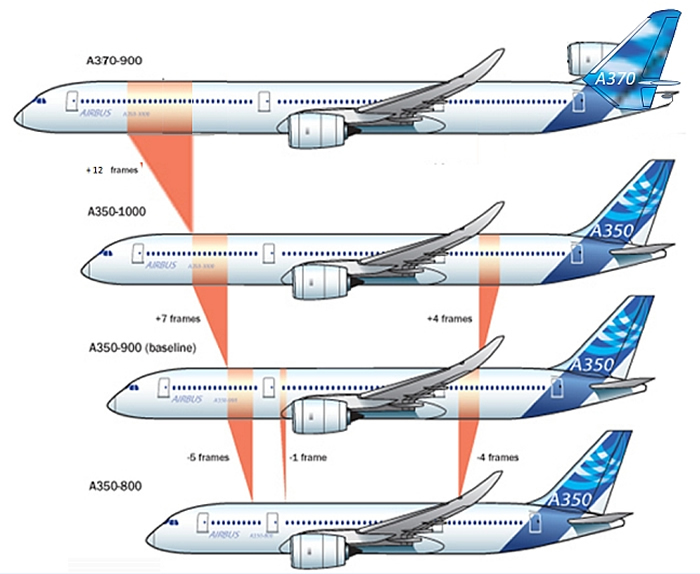 There are three variants of the A350 and all launched in 2006. 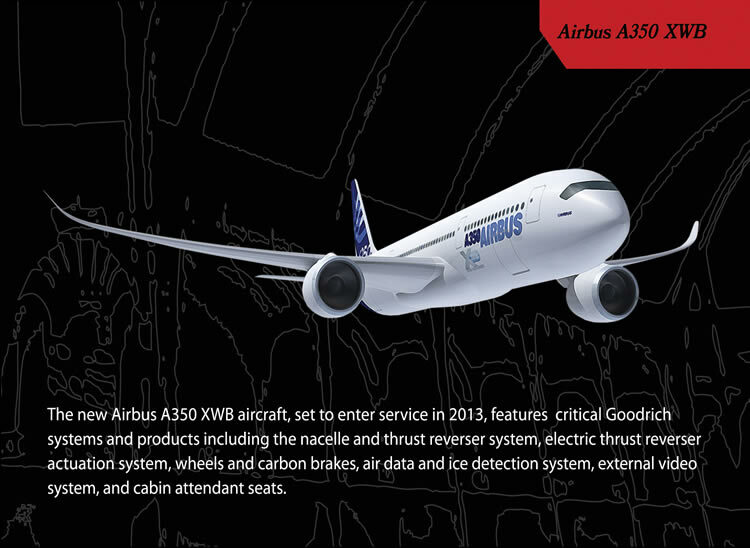 The A350-900 will enter service in 2013. The A350-800 will enter service in 2014. 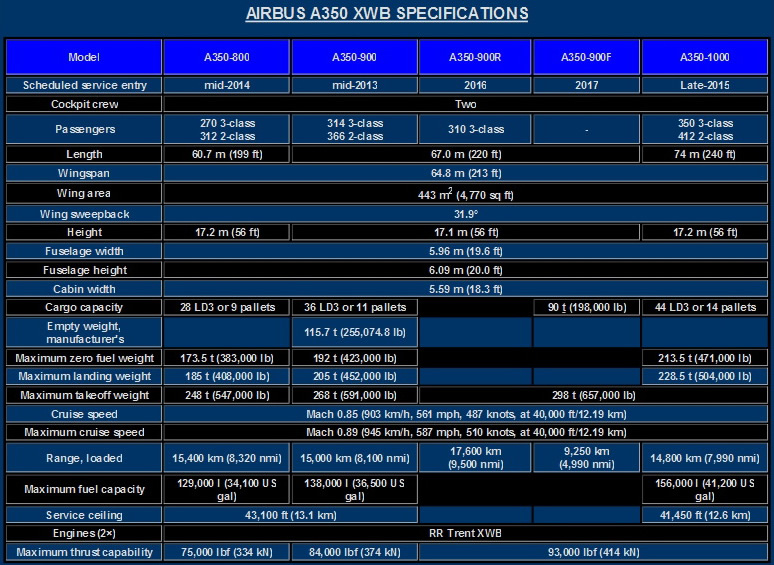 The last to enter service will be the A350-1000 in 2015. The A350-800 will seat 270 passengers in a 3-class cabin and will have a range of 8,300 nmi (15,400 km). The A350-900 is the first to enter service (EIS) in 2013 and seats 314 passengers in a 3-class cabin 9-abreast layout. The airplane will have a range of 8,100 nmi (15,000 km). Airbus claim that the A350-900 will have an increase of 16% MWE per seat, 30% in block fuel per seat and 25% better cash operating cost against the Boeing 777-200ER. A -900R and -900F variant also is being proposed but not launched yet and will feature the higher engine thrust, strengthened structure and landing gear of the -1000. 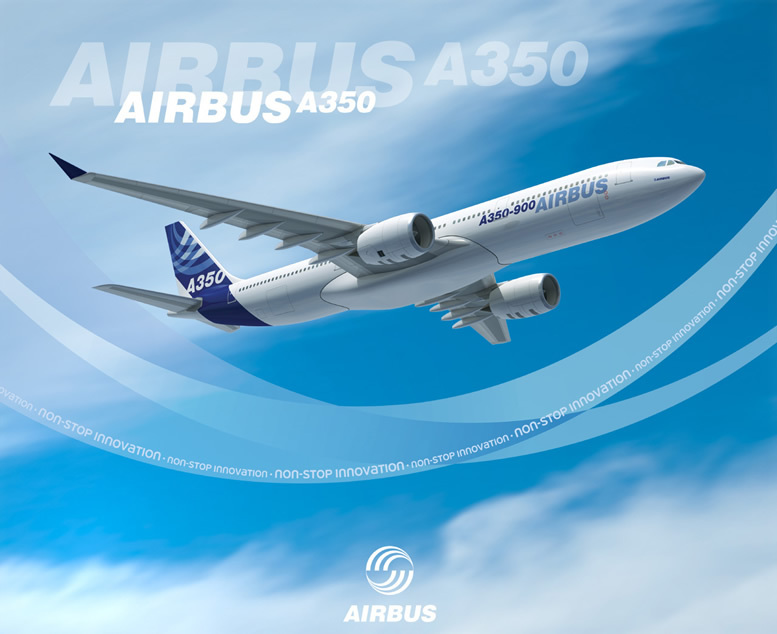 The A350-1000 will enter service in 2015. It is the largest variant of the A350 family and will seat 350 passengers in a 3-class cabin. It will have range of 8,000 nmi (14,800 km).